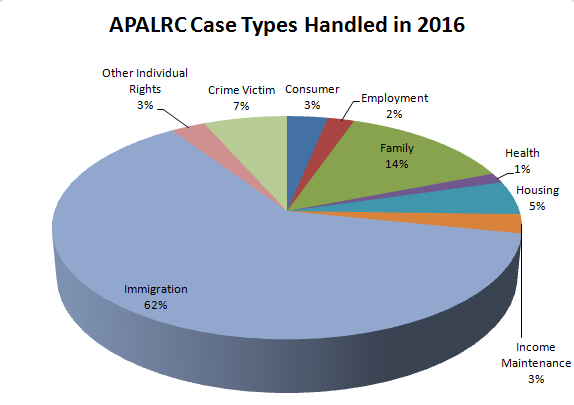 The APALRC staff of three attorneys and one program assistant provided legal assistance in 619 legal matters in 2016. We assisted 136 lawful permanent residents in their quest to become U.S. citizens; represented 73 victims of domestic violence so that they and their children could live free of abuse; provided two tenant associations with the legal knowledge to fight to save their homes and the gentrification of their ethnic neighborhood. We also assisted 31 victims of crime in understanding the criminal justice system; and helped 6 crime victims in obtaining over $34,000 in crime victim compensation. Along with the provision of legal services, the APALRC staff conducted Know Your Right seminars on legal issues affecting our AAPI clients, including seminars on the naturalization process, immigration relief, orders of protection and social security benefits. In February 2016, staff attorney Enoch Chang was appointed to the District of Columbia Court’s Language Access Advisory Committee for a three year term. 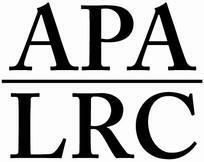 The APALRC also moved to a new location, 1627 K Street, NW, in June 2016. This new office space, close to Farragut Square, is easier to access for many of our clients as it is near to four metro lines and several different bus routes. Finally, 2016 saw the departure of staff attorney Grishma Pradhan, who provided invaluable legal services to clients in both immigration and family law matters, including protective orders, visas for victims of human trafficking, and temporary protected status for Nepali nationals due to the devastating April 2015 Nepal earthquake. One of the most significant accomplishments for the APALRC in 2016 with its legal partners, the Legal Aid Society of the District of Columbia and pro bono counsel Arnold & Porter Kaye Scholer LLP, was the D.C Court of Appeals decision in the Museum Square case. The legal issue under review by the D.C. Court of Appeals was whether the owner of Museum Square violated the District’s Tenant Opportunity to Purchase Act (TOPA); specifically, whether the asking price for the building given to the tenants was a “bono fide” offer under the Act. After hearing oral argument on February 18, 2016, the D.C. Court of Appeals held, on September 22, 2016, that the building owner’s asking price was not a “bona fide” offer and was, therefore, a violation of TOPA. This ruling was not only a victory for the Museum Square Tenants Association, but also for tenants of other subsidized housing complexes within the District who may face the loss of their subsidized unit due to building owners “opting out” of the Section 8 program.